Whether you’re throwing your own New Year’s Eve party, staying home with the family, or going out for a night on the town; we have some suggestions to make the night a blast! Indoor camping– Get a small tent, put on a fire, roll out the sleeping bags and settle in for some “outdoor” fun. Don’t forget the s’mores! Board game competition– Gather your favorite board games for a night of friendly competition. You could even set a point value for winning each game. The winner gets bragging rights for the whole year or until the next competition! Flashback of the year– Look through photos of this year and reminisce of the good times and even those bittersweet moments. Letter exchange– Write a letter to your spouse or loved ones, sharing how they enriched your life this year and why you appreciate him/her. Treasure hunt/scavenger hunt– Create a treasure hunt, complete with clues and a treasure around your house or yard. You could even include activities that each participant has to complete when they get to each destination. Create a time capsule– Take a stroll down memory lane by creating a time capsule of world events, family happenings, and popular trends. Open next New Year’s Eve to see how things have changed. Plan your year– Get out the calendar and plan your year. Don’t forget major events, birthdays, anniversaries, and some date nights. As you plan, set your goals and how you plan to achieve them. Clock Theme A simple and classy party theme. You can hang them all over the walls, use as place settings, decorate food platters with them, etc. You can also make some out of paper, plastic, or any other material you have around the house! 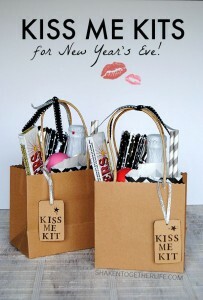 Kiss Me Kit If you’re planning on ringing the New Year in with a significant other, considering making these adorable kiss me kits. 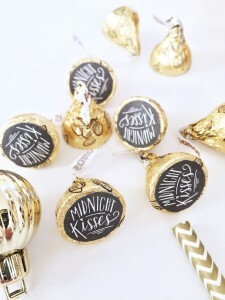 They’re customizable and provide a fun and romantic way to start the new year! Midnight Supper Consider having a light midnight supper after the countdown is over and the new year has begun. You can do anything from soup to a baked potato bar. Confetti Decorations Decorating for parties can be expensive. This is a fun and colorful way to decorate your home without breaking the bank. 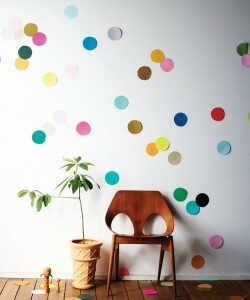 Just cut out some colorful dots with construction paper and attach them to the wall. Easy as pie! DIY Masks This is a fun activity to do with your guests. You can find basic masks at your local hobby or craft store, along with glitter and other fun supplies to create a custom masquerade mask! 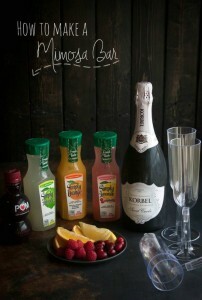 Mimosa Bar A mimosa bar is a perfect pairing for all of that New Year’s champagne. With some assorted juices, fruit, and champagne; this is sure to be a hit with guests! Midnight Kisses Share the love at midnight with these midnight kisses! 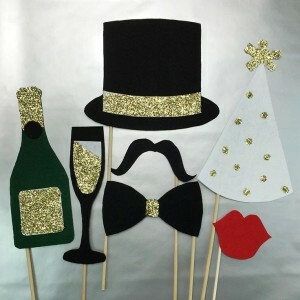 New Year’s Photo Booth Even if you’re hosting a party in your own home, your guests can enjoy a photo booth to capture the memories. A simple background can be created by hanging some fabric, streamers, or paper on the wall. Props can also make the photo booth even more fun! These could easily be created with sticks and construction paper, or purchased at your local party store. 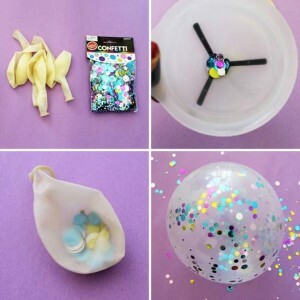 Confetti Balloons All you need to make these confetti balloons is a funnel, some confetti, and some balloons! When the clock strikes midnight, pop the balloons and have a confetti celebration! Going out on the town? Be sure to have a designated driver arranged for your New Year’s Eve plans! Sincere thanks to all of our customers for making 2015 a year to remember! 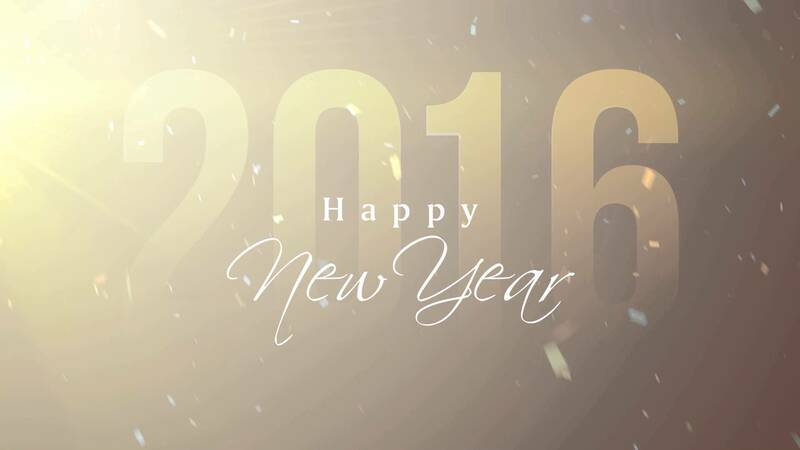 Happy New Year from all of us at Wetzel Auto! 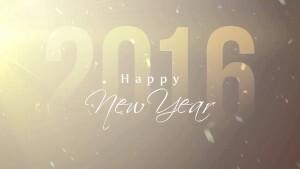 0 comment(s) so far on Welcoming 2016!